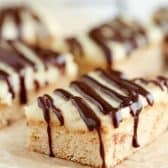 If you love Boston Cream Pie nearly as much as I do, you’re going to go crazy for these totally amazing blondies!! I think I could’ve literally eaten the entire pan myself! Preheat oven to 350 degrees. Line an 8×8 pan with foil or parchment paper. Cream sugar, butter and vanilla. Add in egg. Stir in flour mixture. Press into prepared pan and bake 20-22 minutes or until lightly browned. Cool completely. Over medium heat, combine milk and 3 tablespoons sugar. Bring just to a boil. In a small bowl, whisk egg yolks with remaining 3 tablespoons sugar and vanilla. Add in cornstarch and stir until completely mixed and smooth. Slowly add 1 cup of the hot milk to the yolks and stir well. Pour the yolk mixture back into the pot and whisk continuously over medium heat until mixture thickens. Cool slightly in the pot for about 10 minutes, stirring every 5 minutes. Spread custard over prepared bottom and refrigerate until completely cooled. Once cooled, cut into squares. Bring heavy cream & corn syrup just to a boil in the microwave. Add chocolate chips and let sit 5 minutes without stirring. Whisk until completely smooth. Drizzle over squares and let cool. Refrigerate until serving.